Whatever final decision is made with the login and lock screen blur in 5.15, please provide an option to disable it. We now understand that this is a design decision based on the visibility of controls with light colored backgrounds, but Plasma users should have the CHOICE of whether to use your solution or not. Please do not force this upon users. For a lot of people you are providing a solution to a problem that simply does not exist. 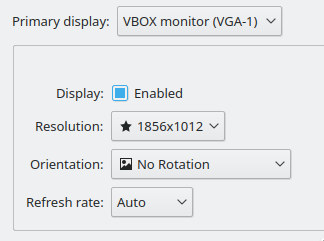 Choice is what defines KDE and Plasma, please continue with this implementation ethos and don’t resort to imposing visual aesthetics upon users the way Gnome does. Aside from that another very productive week, really looking forward to the 5.14 release. Yes, adding an option to disable the blur entirely on the lock screen is under consideration. It might help to use the general animation speed setting for the blur speed. For me, it’s the animation of the blurring that is visually unpleasant. Hey, they’s not a bad idea! Can you file a bug to KScreenlocker | Breeze Theme? Thanks! Hello Nate. First of all: a HUGE THANKS for making KDE consistent and more stable!!! EXACTLY what is needed at this stage to “konquer” back some territory. – I think switching sound from usb speaker to headphones should not only work for eg vlc but also youtube (always works for my laptop, not so for the desktop). – In the past switching from wireless to wired would freeze the GUI (fixed now?). – samba should work reliably. Always. Basically I have to to feel I can trust KDE blindly with regards to stability. Perhaps to make it even more clear: The whole thing is nice enough to look at, everything works quite well, but now make it really ENTERPRISE-READY!! Just a thought: perhaps the advantage that Gnome has is that it is the desktop of choice for enterprise-grade versions of linux, and paid developers do the boring, but necessary work there… Does that make sense? Can we somehow get that stability and functionality and still keep it KDE? Thanks again, I think you have one of the most important jobs at KDE!! The issues you bring up are exactly the point of the Usability & Productivity initiative. The first and third one are on my list, and the second one is fixed, I’m pretty sure. What are the things that make you want to switch to another desktop? Believe me, the VDG team thinks about this constantly. 🙂 We definitely want to tweak the basic appearance of apps to make them feel more elegant and less cluttered (without removing any features, of course!). After 5.14 will be released you will be probably more busy with 5.14 bug squeezing then 5.15 ;). Just saying – that’s the nature of things. Will there be a way to add image layers as well and not only text? Foxit and Adobe Reader have this possibility and it’s nice to add a scalable png stamp (without background) scans to the document. I’m aware that’s not the same as real signing with certificates but for many, that’s all we need. Just some graphic sign on the document and all is good. Currently, I need to have foxit reader for this functionality. For everything else, Okular does its job well. IMO Okular is currently the best Linux native pdf reader. 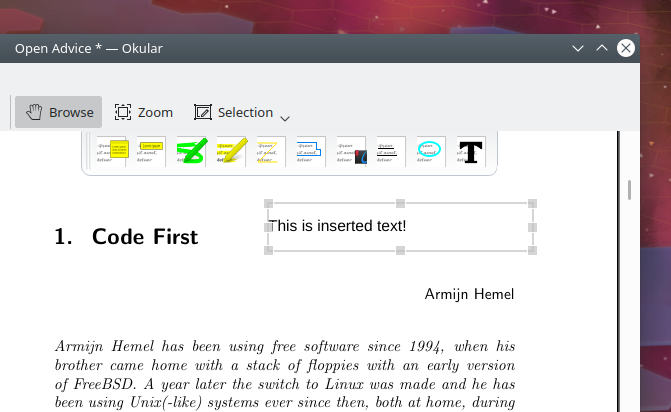 However, I saw many complaints about the old look of Okular and some other KDE software UI. I don’t have that problem, because with heaving theming from Kvantum theme it looks awesome but the default look and look on gtk DEs scare some away. I frankly don’t remember how it looks in a vanilla state so I’m not sure what is the fuzz about but I saw that many times. So no complaints from my side but it’s worth to look at basic UI and look on Gtk DEs. Some other KDE apps were also mentioned as guilty of this but I don’t remember which ones. I believe Okular is the one most popular outside Plasma. Note that there is a bug that prevents the stamp annotations from showing up in some other PDF readers: https://bugs.kde.org/show_bug.cgi?id=395660. There is an upstream Poppler patch that solves this: https://gitlab.freedesktop.org/poppler/poppler/issues/139. I hope it gets merged soon! As for improving the look-and-feel, that’s on our radar screen too, but it would involve changes to the default Breeze theme, so it would benefit all apps. I don’t have any links for this yet since it’s in the very early planning-and-discussing stages right now. Even when you told me that there is a tool for it and I read the bug description and know there should be some text box for a path to a stamp file, I can’t see it anywhere. I went through all the menus and nothing. Maybe it’s sitting somewhere and it will be obvious once someone points that out, but finding it on your own is near to impossible. 3. It should have clear name or icon point to what it is, so either stamp icon or image icon suggesting that we can specify image there. Now it’s just a name. 4. Bad translation adds to the confusion -> this calls for a translation bug, assuming this is the tool… since I can’t get it to work so I can’t be sure. 5. Tools and their setting should be put outside general Okular settings IMO, I may be wrong about it but let’s take for example LO, I see Format and other tools in the menu and access their various settings directly, not within LO settings. 6. To show overlay tools it is called “review” in Tools section while in Okular settings it is called “footnote”…. so it looks like the translation team was either drunk or didn’t care to check the context of what they are translating, so this is a big, big mess. I can imagine this can be similar to other non-English translations because usually, it’s too much work to check every single world so translators just “shoot” for the best meaning they think it may mean without checking what it actually does. So it’s not only the issue of lacking “upload image” button but also the whole UI. If this feature exists, it’s really not findable even if one try to find it. I’m not jumping into it just yet, because I may be wrong and the tool is completely elsewhere but this all is too confusing to find out on your own. Yes, we’re quite aware of the feature’s UX shortcomings. 🙂 That’s why we’re currently in the process of fixing it! Please don’t remove the blur from the login screen. Maybe reduce it a little bit but don’t remove it entirely. That would be a huge step backwards. Can you clarify why you think it would be a “huge step backwards?” I want to emphasize that feedback for the always-dark-and-blurry login screen has not been terribly positive, which is why we’re revisiting it. It’s important to listen to feedback, otherwise why are we even doing this? I was running Kubuntu 18.04. 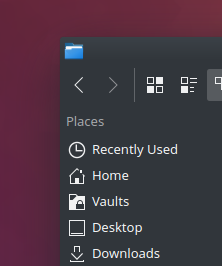 (Plasma 5.12) till 2 days ago when I installed the new Neon, so I immediately noticed the difference – 5.13 feels much more refined and premium with the blurred background. The thing is, the blurred login screen background was a visual upgrade for people who had not changed the prior background (a solid bright blue color), but it was a visual downgrade for people who had changed the background to a pretty image of their choosing, or the default plasma wallpaper, or anything else–because suddenly their chosen image was blurry and dark. What we need to do is make sure that it’s an upgrade for both camps. Nate is already taking that on phabricator , appreciated Nate! Until the option to disable blur is added the only way to remove it is using a SDDM theme from the store with no blur. But it only solves half the problem it only works on the first login because once you lock the system the default theme will appear and that haves the blur effect. Since it seems the lock screen and login screen use different themes. To clarify: this is for the login screen only, not the lock screen. Right? I really like the blur effect on the lock screen, but I don’t care that much for the login screen. I only login to my laptop a couple of times per month (usually after some big upgrade) so it’s not a big issue for me. Correct, login screen only. The lock screen on the other hand has gotten a really good reception, so we’re not going to touch it except for minor tweaks here and there as required. Congratulations to all on the progress! I was going to manually type in the Australian Holidays after I could not find a complete ical to install. Let me know if I could do this for KDE so others can install it. Cool, just click on the link for that one to see how the submitter did it. Feel free to submit your own! Let me know if you need a hand. Hi! I use KDE Neon 18.04. If I set Breeze-Dark as my working area design, all colors and designs are set appropriately, with the exception of the GTK-2/3 designs. Same accounts if I move back to Breeze. Is this already fixed or shall I open a bug report? Maby you can lead me how to fix it myself as it should not be too difficult. Please feel free to file a bug for that! Whether it’s Qt’s (failed) responsibility or not, it’s certainly a usability thorn in KDE’s side. Definitely Qt’s responsibility. That said, KDE developers submit a lot of patches to Qt, so there’s probably something we can do about it. First of all: thanks for your effort. As a long time KDE user this is exactly what the project needed and needs: an eye for detail to fix all the small annoyances in stead of this on-going and relentless push for more functionality. Now, on the part of the login / lock screen can I ask you to look into this very small detail: when the screen is locked I usually enter a key to get it out of the lock and to be able to enter my password again. However, the login dialog sees this enter as an input for the password itself, usually ending up in a ‘wrong password’ on every first attempt when the screen is locked (or coming back from standby etc.). So the problem is that if you hit the Enter key when no password has been typed yet, it tries to submit an empty password and tells you that you got the password wrong? Please file a bug using bugs.kde.org to kscreenlocker | breeze theme after reading https://community.kde.org/Get_Involved/Bug_Reporting. Should be a pretty easy fix, but we need a bug report to track it! I’m already a filled bug about that, Nate. first, let me say I really appreciate the initiative and it has already brought very visible improvements to KDE. I just stumbled about an issue, while trying to set a connection to a secure FTP Server, which requires SSL/TLS, and it is unfortunately not possible with Dolphin currently. As this is a more common scenario in the last few years, I wonder if you can help reprioritize it. But if necessary I can also open a new Bug regarding my issue. Thanks for the ping about that issue. I’m afraid I don’t have the skill to do it, but maybe another KDE developer does! that’s fine nobody can do everything. Just switched to Kubuntu 18.04 (from Ubuntu 14.04) this week for my production machines. KDE is looking very slick. Since you’re working on the login screen, there is some aspect that looks IMHO quite outdated, and that are the icons for the other users. This looks so 1995. Even worse, if you try to change the icon for the other users you get a list with even more silly icons. It would be great to have a list here with both some slick abstract icons and perhaps some ‘nature’, ‘flower’ or ‘animal’ icons that some prefer. Great! Thanks for your swift response!